What a Wonderful Annual Conference! Proposed Changes to by Laws and Policies and Procedures Now Posted! NEAFCS 2018 Annual Session Registration is OPEN! 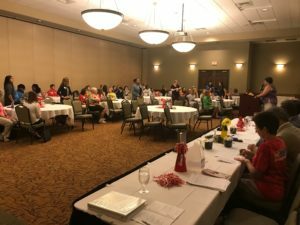 The mission of the North Carolina Extension Association of Family and Consumer Sciences is to empower its professionals to educate individuals and families to make informed decisions. I believe that it is my privilege to give to the best of my ability. It is my responsibility to develop myself to be a better teacher and an understanding friend. I accept the opportunity to help individuals, families, and communities to develop to their full potential. And may I always be willing to accept the challenges of the times.